Life insurance is meant to make your "exit" a little easier for your loved ones. But getting all that cash in one lump sum could be a disaster waiting to happen. Luckily, there's a much safer, steadier way to inherit the money without the risk of losing it all with one bad roll of the dice. Introducing: life insulary annuitization. And our agents know all about it. Our independent network of agents is here to help answer all your questions about annuitizing your life insurance benefit. They'll weigh the pros and cons right before your eyes to help you decide if it's the right solution for you. How's that for a safe bet? What Does Annuitizing Life Insurance Mean? Basically, it’s turning a financial windfall into a nice, steady income. When it comes to life insurance, this means that the beneficiary chooses to receive their payout either monthly, or yearly, in little bits—as opposed to one big ol' juicy lump sum. They can’t be touched in a lawsuit—important if you know settling the estate is gonna get dirty. They can be transferred from person to person without tax penalties. They can be fixed or variable. Fixed annuities pull from an amount of money that’s decided upon before your death and not touched. Variable annuities are invested, meaning monthly payments could grow (or, unfortunately, shrink) over time. Side note: This is often referred to as a life insurance annuity. Problem is, that isn’t a thing. It’s two separate things. After the policyholder passes, life insurance is given to the beneficiary as a payout, but an annuity is an option for how they may choose to receive the money. See the difference? How Does Annuitized Life Insurance Work? In short, your beneficiary tells your insurance company that they would like your life insurance policy to be annuitized upon your death. Next, you’ll both decide the frequency and term length of the annuitized payments, you’ll both sign a couple of pieces of paper, and voila, you’ve got yourself an annuitized life insurance policy. A fairly common use of an annuity is to help your children pay for college if you pass away ahead of schedule. 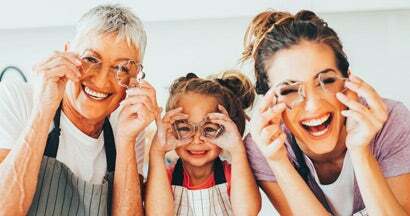 An annuity can provide them with monthly payments until they’re old enough to support themselves, so think about your heirs’ financial future when finalizing your terms. Pro tip: Quadruple-check that the company providing your life insurance annuities is reputable. Companies go under. You don’t want your loved ones left penniless and ticked off if the insurance company didn’t pan out. Our independent agents can help you evaluate this. But at the very least, spend some time asking around, searching the web, and doing whatever else it may take to feel confident in your decision. Who Needs Annuitized Life Insurance? In short, if you have children or other dependents who need to be supported after your death, you should consider annuitizing your life insurance policy. Annuities can function like child support or an allowance, which makes day-to-day life easier for the people you might leave behind. They're also good for wealthy folks who want to make sure their heirs spend their new fortune responsibly—sorry, kiddos. With an annuity, there's no way to spend all the money at once on ice cream cones and fur coats. Instead, your beneficiaries will get a regular income to use for more ordinary stuff like rent and student debt. How Much Does Annuitized Life Insurance Cost? It doesn’t cost anything beyond what you’d already be paying for life insurance. It’s just a change to how your policy will be disbursed, not a change in the amount. In fact, annuitized policies can be easier, and cheaper, to get than lump sum policies, since insurance companies don't have to cough up the money all at once. It helps them and it could help you. Scratch their back and they'll scratch yours, metaphorically speaking. Nobody likes thinking about their own death. Our independent agents are here to help you navigate your life insurance policy forwards and backwards. If you’re interested in annuitizing your life insurance policy, they’ll help you file the paperwork and explain all the fine print.